The SUNY Oswego music department will present the Bacchus Saxophone Quartet -- performing a wide variety of styles appropriate for all ages and musical tastes -- at 3 p.m. Sunday, March 3, in Sheldon Hall ballroom. Part of the Focus on Faculty series, the recital will feature Steve Defren, Marilee and Dan Blumenthal, and Trevor Jorgensen. Music by famous American composers will include arrangements of "Four Piano Blues" by Aaron Copland, "Three Preludes" by George Gershwin and Cuban-American jazz saxophonist and clarinetist Paquito D’Rivera’s original work "New York Suite," according to Jorgensen, a member of the music faculty at Oswego. "Traditional Celtic melodies based on Scottish, Welsh and Irish folk songs arranged by Paul Harvey in Celtic Collage will delight the audience with memorable tunes," Jorgensen said. "Of course, no saxophone quartet recital would be complete without a couple of standard tour de force French saxophone pieces, including Eugène Bozza’s 'Andante et Scherzo' and Jeanine Rueff’s 'Concert en Quatuor.'" 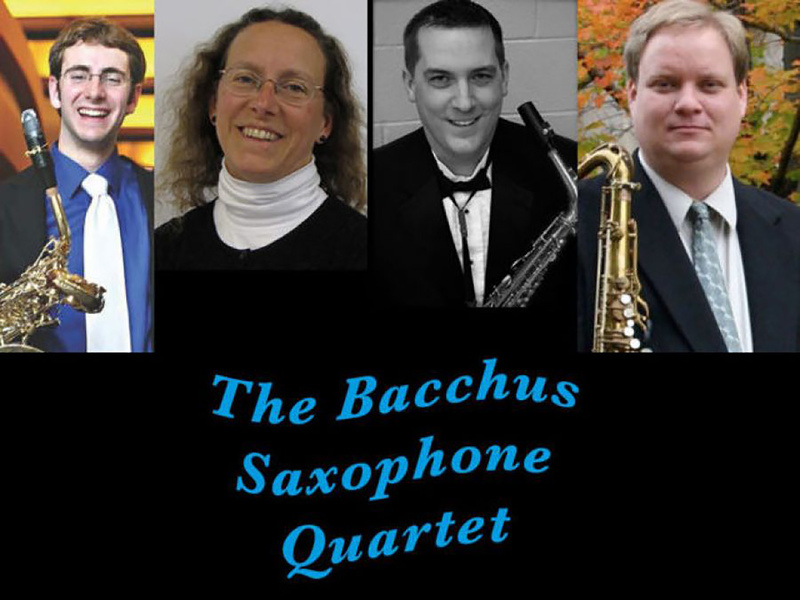 Tickets for the Bacchus Saxophone Quartet performance are $8 ($5 for youths, people over age 62 and alumni of SUNY Oswego) and are available at SUNY Oswego box offices, online at tickets.oswego.edu or by calling 315-312-3073. People with disabilities needing assistance to attend should call 315-312-3073 in advance of the recital. For more information on the fine and performing arts, visit arts.oswego.edu. Saxophone times four -- The Bacchus Saxophone Quartet -- from left, Steve Defren, Marilee Blumenthal, Dan Blumenthal and Trevor Jorgensen -- will perform a wide variety of musical styles in a Focus on Faculty recital at 3 p.m. March 3 in SUNY Oswego's Sheldon Hall ballroom.